Now that I have all of the pertinent joinery worked out and detailed, its time to tackle my first design. This first iteration of the Hillbilly Tansu will be like most of my other projects, functional, clean lines and simple construction. There are several factors that lead me to develop this style of cabinet/chest. First is that I like the look of the Japanese tansu. I have always found the tansu to be a good representation of functional beauty and have wanted to make one for a long time. The second factor is that I wanted to develop my own repeatable and adaptable system of construction. I think I’m on the right path. Time will tell. The third factor is that I wanted to develop the construction around materials and sizes that are readily available to me. For the most part this means big box store. In my area that means pine and red oak. I’m ok with that. So why go to all of this trouble? I want to spend the little shop time that I have building, not prepping materials. By designing around materials that I can buy “off the shelf” close to my needed sizes I can quickly surface plane the material and jump right into the construction phase. Will this work out 100% of the time? Nope. But will work for me in most instances. Like most of you, I have a day job. That takes up 50-55hrs a week of my time. Then is family and a home to take care of. So my shop time is limited to just a few hours a week at best. I want to make the most of it. I’ll assess the viability of this pipe dream after I have this first design constructed. Hopefully all of the work that I have done to this point will pay off and I’ll find that everything works out as intended. If not, I’ll tackle any of the issues that present themselves. This first design will be to house all of my drawing and knot tying supplies that I keep in the house. The approximate finished size will be 24″(H) x 24″(w) x 14″(D). This size will best utilize the size of birch plywood that I can buy locally. Coincidently, this size is very close to the listed sizes of antique tansu that I have researched. Thus begins the Hillbilly Tansu project. Your welcome to follow along as I either fail miserably or succeed marginally. 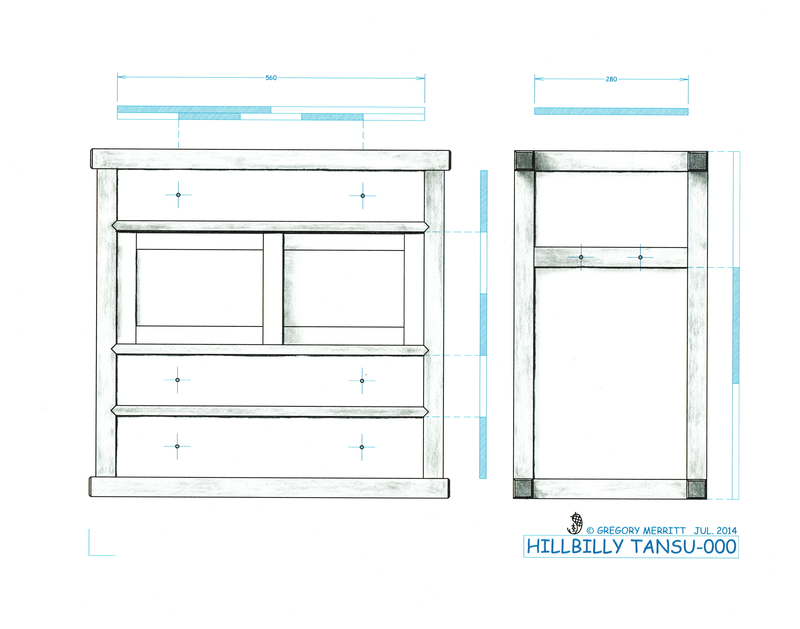 This entry was posted in Design, Hillbilly Tansu-000, Illustrating and tagged Design, Hillbilly Tansu Project, tansu, Woodworking. Bookmark the permalink. In my opinion… this project is already 1/3 done (1/3 to the idea and drawings, 1/3 building, 1/3 finishing). And you even tested your joinery. So you already succeeded! Great minds must think alike. LOL I like your optimism for my success. I, on the other hand, will worry about it until this first project is complete. I’m always nervous when it comes to something I designed entirely on my my own. I think I’ve covered all of the potential issues, we’ll see. Thanks. I’m eager to see how, or if, it actually comes together myself. I’ve put a lot of up front work into this because I hope that I will be able to utilize the construction methods for several other projects I have in mind. So I’m anxious to flesh this first one out and see how everything comes together. I want to see how it actually looks and functions. If all goes as planned, I’ll have a go at the next iteration. Thanks you also for the kind words in regards to my drawings. They are how I think through a project. I use AutoCad at work every day, but find doing my project drawings by hand relaxing. Plus I feel that hand drawings have a “soul” that can’t be achieved with a computer program. I do the same thing with SolidWorks, it helps me figure out the joinery and how I’ll approach it. It’s great too for making patterns when a project needs something like that. I made full size patterns recently for the piercing on the skirts for a little G&G table I’m building. You want need it but Best of Luck anyway. Thanks David. Its ambitious for sure. We’ll have to see how, or if, it all comes together.